UB92 had the most liked content! I have a few thoughts on this... 1. I strongly suspect Alnutt will assume people are leaving (even if it would only be for "stupid money") in the future and prepare accordingly. I mean, if anyone is supposed to be prepared, it is him (not the media, fan base, other coaches, players, etc.) It is what it is at this point. 2. There are posts from people on this board (at that time) that basically still think Oats was leaving even after he signed the extension. Heck...there were also posts on Twitter, but I don't count that as much. So when you say that, basically, no one knew...some people on this board still had that feeling. You have put words in my mouth. I knew it would have an impact. I wanted to keep as many recruits as we could (since it was projected to be the best class ever) OR if we were going to lose recruits, make a splashy hire and build on the momentum. We did neither. I am disappointed. And now I am being told (here and on Bullrun) that "look...it could have been worse". This, to me, is BS and I have seen it at various points throughout my career. I am calling it out. So...once again...your point is that "we didn't lose as many players as Nevada or UMKC so it isn't bad?" You keep comparing to a worst case scenario. It is the same argument as above, stated in a little different way. The fact is WE LOST ALL OF OUR RECRUITS. Could it have been worse? Sure...but it was still bad. You are trying to convince yourself otherwise, obviously...and others (since you started this thread). We had more to lose with a bad search, in my opinion, then those other two. Heck...UCLA is still a blue blood...they convinced the TN coach to leave his team to come to UCLA (but wouldn't pay the buyout). St. John's is a historic program. We had one year of being ranked and nationally relevant. If you want to convince yourself (in retrospect) that it wasn't bad since it wasn't as bad as two other terrible things, that's fine. I can't make you think otherwise. That's like when my son says "The average was a 70...I got a 55...but several people got below 40". Small ball is good...just hope you never miss a shot on offense and the other team takes long 3s so the rebounds come out to your guys! Heck...even with the players we had this year, we were manhandled some games inside on rebounds (even though we won, so that was the trade off). Ethics and coaches in top college sports don't go hand in hand! The part I find interesting is that (beyond Hawkins) Alabama feels as though some of the recruits that have decommitted from UB are P5 material. I would have thought Alabama's name could pull better recruits. If not, it just underscores/reiterates how well Oats/Hodgson were doing from a recruiting standpoint while at UB. It would have been interesting to see, if Hodgson was given the UB job more immediately, how well he could have pulled in some / kept some of the recruits. We'll never know, but that's always been an unanswerable question in all that has gone down. That was me...first post in this thread. You just listed a bunch of excuses...are you Alnutt's PR person or something? The two outcomes that are important are the fact he hired his interim 10 days on when time is of the essence because of the recruiting class AND all of his recruits left. If all of your recruits left because you took too long since you had to hire this fantastic external coach only accessible through a search...it is what it is. If you didn't hire the brand name coach you may have wanted since you wanted to move quickly to keep your recruits...so you hire Whitesell in a few days and keep your recruits...it is what it is. As I mentioned before, he got the bad part of both strategies. If you are saying that Alnutt should get a pass because he only had one year to know Whitesell and he is a football guy, but White had longer and he is basketball guy, that is 100% BS. It really is. If he is planning ahead for Oats leaving (and Oats basically said..."stupid money, I am gone"), then Alnutt should have learned much more about Whitesell during his whole time if he really thought he could be the next guy in (w/o running a search). It is a fail. So...while you say it "might not necessarily be an indictment of him with regard to the situation", I am saying it is -- in my opinion. He won't admit it (obviously) and nor should he -- he has to protect himself, his job, his career, etc. I am telling you, though, that (from my perspective) it is a fail. And I am not saying he is a bad person at all...people fail at aspects of their jobs all of the time. Hopefully this makes him more prepared in the future, but UB MBB is the victim right now. I truly, truly hope that he has had several conversations with the other WBB coaches at UB recently. I am telling it like it is...the way I see it. However, it is what it is now. I am moving forward. I bleed blue and always have. Go Bulls. Actually, I disagree 100%. I read the article and it is a lesson in how to package the events of the past week or two and place them into what was a "plan". It is exactly what you would expect (and what I mentioned would happen). It is the logical result of the situation that has occurred. My life's experience has demonstrated to me that people in administrative positions are able to become somewhat of revisionist historians...blending what has actually occurred into their "plan all along". It is a defense mechanism and one that helps you keep your job. I am not young. It has been almost 30 years since I've graduated, so I have seen my fair share of how organizations work. Alnutt's quotes from TBN article sound like the story you tell after the fact to make the events seem like they were all part of the plan. Of course, the two facts are: (1) The interim coach, ten days on, becomes the head coach, while there is immediate precedence for making a quicker decision w/o a search and (2) all of the recruits opened up their commitment. Those outcomes are process fails and, I suspect, most inside this business (btw, this is me speculating, but this is a message board) would tend to agree with my conclusion. His quote about UCLA is a distraction...the one straw man you can knock down ("see...look at what this other school is doing...we are not that bad...it is even UCLA"). So...if you want to believe that the article "put to bed all the rumors that have been circulating"...fine. They were writing that article for you. Also...while the involvement of the players are great, the comments that they made are the kind of comments that Guy Fieri makes when he is eating something at a diner that is only okay...he has to come up with a generic comment that doesn't say it is good ("man...you can really taste the peppers", "I have never had a burrito like this before", "cheese...on Chinese food...you've blown my mind".) Look at Graves' comment: "I told him that I'm comfortable with how (Whitesell) coaches", said Graves. That is not what I would call a ringing endorsement at all. And Graves is to be your "star" player next year. Even the quotes of others are that he's a nice guy, a great man, has experienced, is committed to Buffalo, etc. I don't read that he is "a great basketball mind", "a master motivator", " a fantastic game planner", "gets the most out of his players", etc. Those are my thoughts. I will move on now from this topic and hope he can get some of the previous commits to stay. Sure...there is always going to be guys available to fill scholarships, but we've had many of them in the lean years...and they are MAC bench players (who are sometimes stretched into starting roles). The last several years, we really haven't had that. Our bench has been so deep and overwhelmed the other teams. We will certainly take a step back this year. Whether it is to being a #3 seed instead of a #1 seed or are we back to mediocrity? Time will tell. The next week or two will go a long way towards determining where it may end up. As always, Go Bulls. Rather than mixing in questions about Alnutt's strategy into a thread about the new coach, I decided to make another thread. Not everyone, but many posters believe: 1. Alnutt didn't have a list or didn't have a good list of replacements available should Oats leave. 2. Should have just given Whitesell the job initially if he felt that he was going to be the best candidate (since it would have given Whitesell the best chance of keeping the recruits). 3. Would, in general, want a "do over" in how he has handled the situation these past two weeks. Today there will be a press conference and it will give Alnutt the opportunity to craft the right story. I don't think it will be very revealing. --- Here is what Alnutt said (from Niagara-Gazette) about the hiring of Whitesell: "After conducting a national search and talking with some of the brightest college basketball minds across the country, it was clear to us that the best candidate for this position was right here in Buffalo". Remember...it took him 10 days to make that realization. Here is what Danny White said (UB website) when Oats was announced: "After hours of conversations with Nate, it became very clear to me that the best candidate to lead our men’s basketball team was already on campus". Two days. This, I think, it pretty damning and paints a picture (in comparison) of someone who (Alnutt) was not as prepared as he should have been for Oats' departure (and certainly not as prepared as White). I get it, though. I hope he is questioning his preparation and this experience will make him a better AD in the future. We all have had experiences where we could have done better in our jobs and the next opportunity (with the current employer or a future employer) will be the beneficiary. But it stinks for the "victim" of the learning experience. This upcoming year was going to be crucial in Oats' development as a coach. Gone would be the five seniors and Oats would have to figure out how to merge all of this talent on to the roster and get them to click. I was interested to see how it would happen. Would it have ended up with a MAC crown? Who knows. But now that is moot. I don't get your point about "goals are much lower to continue the upward trend". So...enlighten me. What lower goals next year, in your opinion, would constitute continuing this upward trend? I am curious. Remember...a month ago we were looking to be the "Gonzaga of the East". 1. You say "The naming of an interim head coach is simply having the most senior member of your staff hold the program together while you decide the path forward for the program". -- I disagree. The whole point of my post (which you apparently missed) is that this circumstance was unusual since it was THE MOST IMPORTANT HIRE that UB has had, for the reasons I mention. And, thus, naming the "most senior member of your staff" as interim, while typical, was NOT THE RIGHT MOVE in this instance, for the reason I mention. 2. You say "You cant name a junior member of the staff as the interim head coach because that is a statement about the path of the program. That is a decision and would be done in haste" -- On April 9th, 2015 Hurley was hired at ASU. That SAME DAY Nate Oats was name interim head coach. Levi Watkins was on the staff at the time...and he had more NCAA experience than Oats. Oats was name the head coach (after being named interim coach) two days later. My contention is that the recruits were so important to the program that Hodgson should have been named interim since there was a crucial need to work on keeping the recruits. But you certain can name a junior member of the staff -- the AD made the choice not to. 3. "Also, I believe Hodgson was gone and not available when Whitesell was named interim. You don’t give the title and power over the program to someone who just skipped town" - Since Whitesell was name interim on THE SAME DAY Oats was announced as coach of Alabama, I am not sure that Hodgson would have left town if he was named interim. That's just a hunch! And I don't believe Hodgson left to Alabama on the same day Oats was announced. Later in the week is when he was seen with Oats. By the way, I am not trying to be difficult. I want to have a conversation about this and, perhaps, I am wrong in my initial assertions. I am glad to be educated by those who have more inside knowledge. Maybe you have some facts I am not aware of. However, I am the fan base...I am not the reporter with the inside scoop or a friend of a friend of the AD (or Hodgson or a player or a GA ). I am telling you what it looks like from my perspective of a 2x alumnus who has been a fan for 30+ years. I gave this more thought overnight. I still have some thoughts I want to get out there. This hire was THE MOST IMPORTANT HIRE IN THE HISTORY OF UB ATHLETICS. I write this, since no other team has been in the national picture for such an extended period of time. 30+ wins in MBB. A national ranking for several months. A 6 seed in the tourney. The incoming recruiting class was to be their best ever. Would UB continue their trajectory towards sustained national relevance and local relevance or go back to anonymity? This is why, I feel, this hire was so important. We are at a bifurcation point. Okay… Oats leaves. This happens. The primary goal should have been to maintain that recruiting class at all costs. Yes…maybe we would lose one or two, but that should have been the focus. 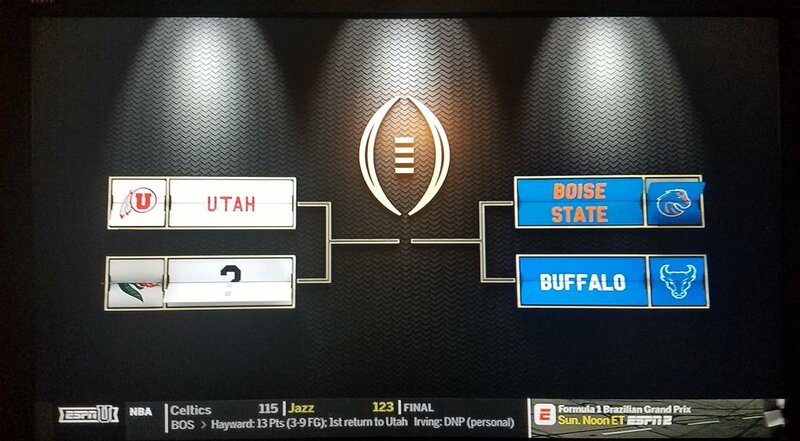 UB was beating the other teams because of their players and their coaching. We know we would get a new coach, but could we keep the same level of top-notch player? Heck, sometimes players win in spite of the coaching. If this was the goal, UB should have focused on Hodgson right away. Alnutt should have made Hodgson the interim head coach. Do you think he would have gotten on that plane and/or been pictured with an Alabama shirt with a recruit if he was the “interim head coach”? No. The decision to name Whitesell the interim head coach had its merits. He was more experienced and, thus, in a vacuum, reasonable. But this was shortsighted and underscores Alnutt’s inexperience. It was the wrong decision to name Whitesell the interim head coach. He had another choice to help keep the class together and he choose wrongly since he didn’t anticipate what would happen. UB Men’s Basketball is the victim of Alnutt learning on the job, unfortunately. With Hodgson as the "interim head coach", he could have been recruiting hard to keep his guys (even Hawkins). They could have still gone with a national search with Hodgson as the interim if they wanted. At least we would/could have gotten Hodgson to work for UB during this important time. Now we have Whitesell, whose skill is not necessarily associated with recruiting. He has no recruiter on the staff at the moment. And he is supposed to salvage the class? Once again, I feel this was the most important hire in the history of UB athletics. UB could have gotten a higher name as a coach (e.g. like Hurley) or gone the continuity route more immediately (like Hodgson). They hired a search firm and, seemingly, did not realize they would have to spend $500,000 or more for these hires or weren’t as attractive as they thought. Instead, they go the Whitesell route 10 days on. This was a fail of epic proportions in execution for what was so important. Could it work out? Sure…there is that possibility. But I would not bet on it at all. I mean, I am a fan and will always be so I hope it works out. But this was just bad execution. Sure, the AD has spun this to say that Whitesell was the guy he wanted all along, but that just opens up very reasonable questions about the execution of the plan. Disappointing is an understatement. Maybe I am wrong, but if they hash out the agreement eating Mexican food, then he could have signed the agreement in Buffalo as well. Then he gets to meet with his players and have a teary goodbye...and thanks Buffalo, the fans, the city, etc. Get's on that plane to Tuscaloosa and is greeted there and announced. That would have been okay for the rank and file. He didn't do that. He (from what has been mentioned on this site) didn't tell his players directly (the AD did) and then a few found him in his office packing up...and then he spoke with those in his office. He sent a message a week later to the fans about his "hectic" week. I think that tells you so much about the character of the person, unfortunately. So while there is a "tendency of fans to turn on their own", I think there is a much (much) higher percentage that have turned because of how it was handled. You are always going to get some who feel betrayed and grab their pearls, but this goes deeper and has impacted more. You have to remember...Nate has skipped a step. To go from MAC to a mid-level P5 is a big deal (with only 4 years of head coaching experience in college). He didn't get to go to Illinois, for example, and try to get them competitive. There's no guarantee his approach will work in Alabama and/or the SEC.